Joey Briggs posts new cover of Imagine Dragons - "It's Time"
Joey Briggs has posted another cover song, this time of Imagine Dragons - "It's Time." Check it out below! This is the second cover he's done with his filmmaker friend Kevin Barry, his brother Jason (of The Briggs,) Alex Zablotsky (Old Man Markley,) and Tristan C. (Snake Oil Salesmen.) You can watch his cover of The Killers here. The War On Drugs streaming upcoming album "Lost in the Dream"
The War On Drugs, Philly's own indie rocker, is streaming his upcoming album "Lost in the Dream" in its entirety. Click here to listen to it. Tim Barry has posted an initial run of European and Canadian tour dates to kick off the summer's festival season. The Richmond, VA native will take his talent overseas in May, starting off on 5/2-Meerhout, Belgium @ Groezrock, 5/3-Stuttgart, Germany @ Pirate Satellite, and then heading to Canada for Pouzza Fest on 5/17 in Montreal, Quebec. He'll be performing his first show on StageIt.com on (March 15th @ 2PM.) He'll be performing mainly new songs. Click here to get your ticket. Tim's latest album "40 Miler" was released in Chunksaah Records in 2012. Now that we're well into March, and warmer weather is ushering in Spring for a vast majority of the country, we've decided to post our inaugural American Roots Playlist: March 2014. 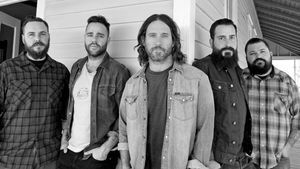 The playlist includes new songs from Chuck Ragan, The Avett Brothers, and The White Buffalo, as well as tracks, recent and old alike, from Joey Briggs, Jon Snodgrass, Austin Lucas, Northcote, Credence Clearwater Revival, and many more. Stream the playlist below!